Are you ready to conquer the world of pie and learn how to bake a pie from scratch? This article is a serious deep dive into everything you need to know about baking pies! Have you heard it’s harder than the other desserts? Everything you know how to do now was probably hard at some stage in your life, and look at you now! 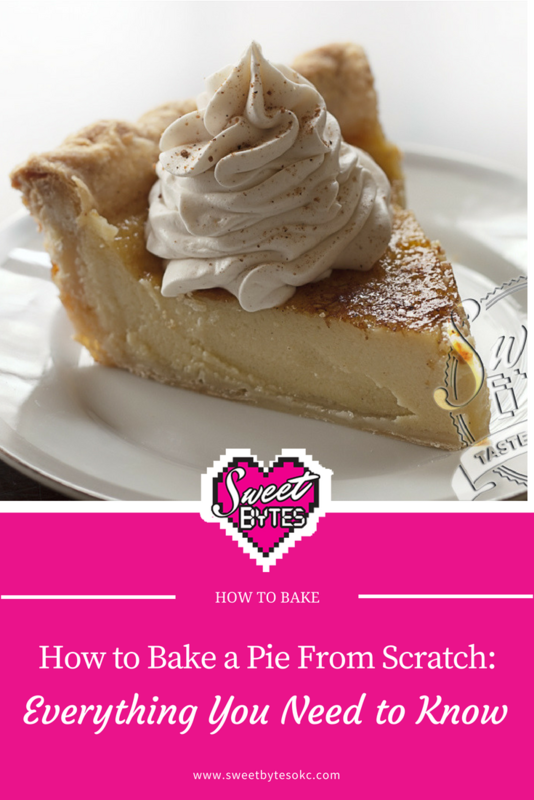 Personally, I started seriously pursuing baking from scratch by learning to how to bake a pie. Even when they aren’t perfect, pies are pretty darn good. Let’s talk about how to bake a pie! pie /pī/ noun: a baked food having a filling of fruit, meat, pudding, etc., prepared in a pastry-lined pan or dish and often topped with a pastry crust: apple pie; meat pie. Pies don’t have to be round, they don’t even have to have a pan. As long as it has a crust, it can be a pie. Pies didn’t start out near so fancy. Pies were possibly around since Ancient Egypt where the filling was baked in reeds. They then passed the pie on to the Romans, who then passed it on to the Europeans, who recorded the first “pye” recipes in the 12th century. That makes is a lot of people learning how to bake a pie over THOUSANDS OF YEARS. Even the first pie recipes appeared 900 years ago! We probably wouldn’t recognize these pyes. They called their shells coffyns and they were meant to transport the filling rather than being the best part of the pie. When the European settlers colonized America, they brought their pyes with them. Thank goodness for that! Now pie is known as “America’s Most Traditional Dessert.” Gone is the coffin-shaped crust and here to stay is flaky, delectable, and delicious! How many types of pie are there? The types of pie fillings and combinations are endless. If you can dream it, it can become a pie. I see new and amazing flavor combinations every time I look at Pinterest or Instagram! I’ll wager anything that makes for good eating, will make a good pie. The only real requirement is that it has to be baked with a crust to be considered pie. The shape or style doesn’t matter. Pies are shaped in all sorts of ways from round to rectangle and everything in between. Hand pies, pie pops, mini-pies, slab pies, free-form pies and super deep dish pies are all common. I’ve even seen tiered wedding pies! It’s amazing how we can push the boundaries of pie making in this golden age of baking creatively! Filled with fresh, frozen, dried or canned fruit, sometimes multiple fruits. These can be made with one or two crusts and topped in a variety of ways. 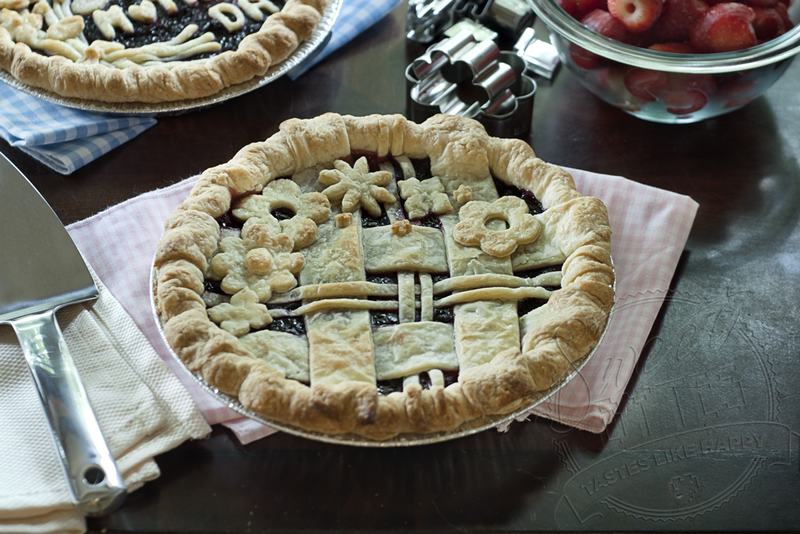 Famous fruit pies include Apple, Cherry, and Triple Berry. Are one crust pies with fillings made with milk and eggs which are baked until the filling sets. 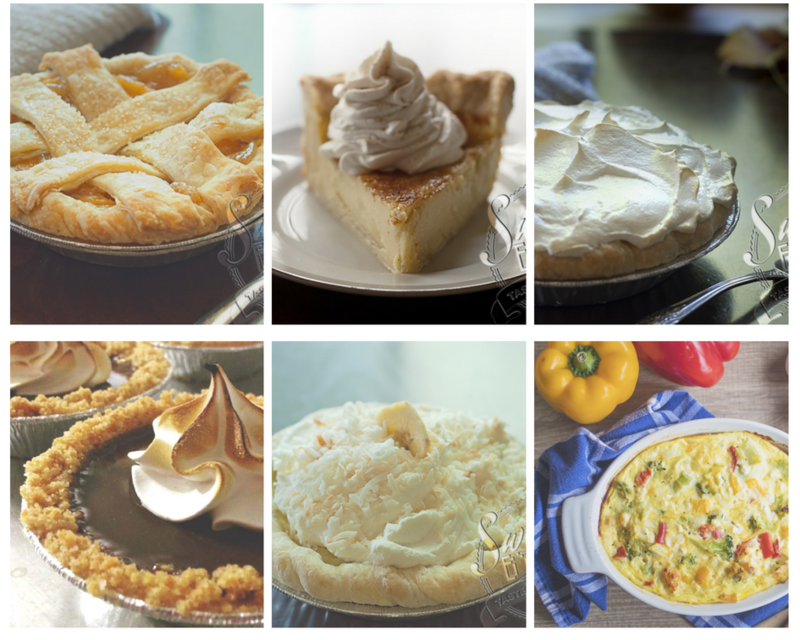 Famous custard pies include pumpkin, buttermilk, key lime pie, and pecan pie. These pies are single crust pies with a custard or cream based filling, poured into the pre-baked crust, chilled until set and then topped with a whipped topping. Famous cream pies include coconut cream, banana cream, and chocolate cream. These are custard or cream based filling, poured into a single crust with a meringue topping made from whipped egg whites or a store-bought meringue mix placed on top of the still warm filling. The meringue is then usually toasted in an oven or with a kitchen torch. Famous meringue pies include lemon meringue, chocolate meringue, sweet potato meringue. Savory pies are usually filled with vegetables or meats and hearty combinations of both. Sometimes they feature other typical entrees like macaroni and cheese. These savory pies mostly have two crusts, a top, and a bottom. If they have a single crust there is sometimes another layer of a savory topping like mashed potatoes covering the filling. Famous savory pies include chicken pot pie, shepherd’s pie, and mushroom leek. What about tarts, galettes, crostatas, cobblers, and quiches? These are cousins of pie that overlap and feature some of the same ingredients as our pie categories. Discussions can get heated real fast when you start talking to loyalists and purists as to what is what. Galettes and Crostatas are the same things, only galettes are French and crostatas are Italian. They are both basically pies without a pan where the crust is folded up around the sides and slightly over the top of the filling. The filling can be sweet or savory. Cobblers are usually cooked with the pastry layer or crust on top. In some regions, the pastry is closer to a biscuit than a pie crust and these people will cut you if you try to tell them that pie crust goes on top of a cobbler. Quiches are savory and don’t have a top crust. Why are the four seasons and pie always connected? The very best time to bake a pie is when you can get fresh, local ingredients to bake in your pie. That is when pie will put all other desserts to shame. If you have a local pie shop, you might have noticed their menu changes with the seasons and now you know why. Certain ingredients are readily available all year round, like eggs, milk, chocolates and dried fruits, and nuts, but many things have a peak season. Thanks to our modern grocers, we can now buy frozen and canned fruits and have a lot of fresh ingredients year around. Still, even at the grocery store, things are better tasting and better priced when they are in season! This chart will give you an idea of how the seasons change what you will be able to purchase at its peak time. Start planning your yearly pie attack plan NOW! Pie Crust makes people avoid learning how to bake a pie. Scratch that… Myths about pie crust are what make people avoid learning how to bake a pie. Pie crust isn’t hard. Really. You just have to know how. Remember when adding single digits was hard? How about the ABC’s? They used to be really hard and we nailed it! Pie crust recipes are all very simple. The thing is, when people get involved, they make it complicated. They start swearing by their methods and spreading information that is based on what they heard and attribute it to “baking science.” They get hooked on their way and poo-poo on the other ways. Everyone has an opinion on how to get it right and everyone swears their secret is THE WAY. You will have to try several until you find one you like. Then you will tweak it several times. Only after that, will you understand why great bakers hide their secret recipes. Really though, there is more than one way to do anything. The right way is the way that gets you in the kitchen baking pie… better yet… enjoying and eating a delicious pie! Pâte brisée– Thin and flaky, rich and flavorful, all-butter crusts. The butter is cut into dry ingredients, then a method called fraisage is used to smoosh the butter into little floury flakes with the heel of your hands. Expert hands can do this without melting the butter. Here’s a recipe link for a pâte brisée from NY TImes Cooking. Pâte Sucrée– This crust is sweet and cookie-like, it is less flaky than pâte brisée. It has egg yolks and sugar, but it is still tender. Bon Appétit’s recipe for pâte sucrée can be found here. Pâte Sablée– This is the sweetest French crust. It has a high sugar content and a sandy texture. It bakes very crunchy and firm and is great for holding a tart filling. A recipe for pâte sablée from The Kitchn can be found here. Even though French pastry is par excellence, nothing is more American than pie. ___________ insert all pie quotes here. Traditional American pie crust is very similar to pâte brisée in texture and flakiness. It is made from basically flour, fat, salt and water. We deviate in that we don’t stay loyal to butter. Our fat could be lard or shortening. We add things to it: like milk, sugar, vinegar, vodka, eggs, sour cream, cheese… you name it, you can probably find a pie crust recipe with it. We do not have standards other than, “Does it taste good?” How American is that? Bang, bang, pow, pow! Pie crust cowboys is what we are. Really great American pie crust should be easy to handle when rolling and getting into the pan. It should be flaky, yet tender enough to easily cut with a fork after baking. Crumb Crusts use some type of cookie or cracker crumbs blended with sugar and melted butter to make a wet sand type of mixture that can be pressed into a pie pan and baked. Our graham cracker crust for pie is a great example of a crumb crust. Press in pan crust is very popular with people who feel like traditional rolling methods are intimidating. The dry ingredients are mixed with oil and then the crust is pressed directly into the pan rather than having to roll and drape it into the pan. Gluten-free pie crusts are also extremely popular and include everything from gluten-free flour blends for a more traditional crust to chopped nuts used in place of crumbs in a crumb style crusts. This last one may surprise you: Go buy store bought crusts. If the crust is going to keep you from baking pie, I give you permission to skip making the dough yourself and buy pre-made crusts. I hope you will choose the kind that comes in a roll that you form into the pan. However, the pre-made, frozen ones can be pretty good too. There are also pre-made crumb crusts at the store. It’s an amazing world. When I first started baking pies and sharing them I used store-bought crusts. I had no idea how to make a crust or even where to begin! Pie crust was supposed to be ADVANCED BAKING 401! Part of my reason for making this site is how lost I felt trying to figure it all out. With so many variations on pie crusts, the “pie crust is hard” excuse can’t hold water. As with all baking, start with a recipe and follow it to a T. Then tweak it or keep searching for a new recipe until you find the one you love and you can make your own. Learning how to bake a pie is made a lot easier when you can have some basic tools to help you along. First, I’ll cover the tools I consider essential and then I will cover things that are really nice to have. The oven needs to be big enough to hold the pans and leave 1” of space in between the pans. The oven should also reach at least 450°F. You can check out my actual oven here. 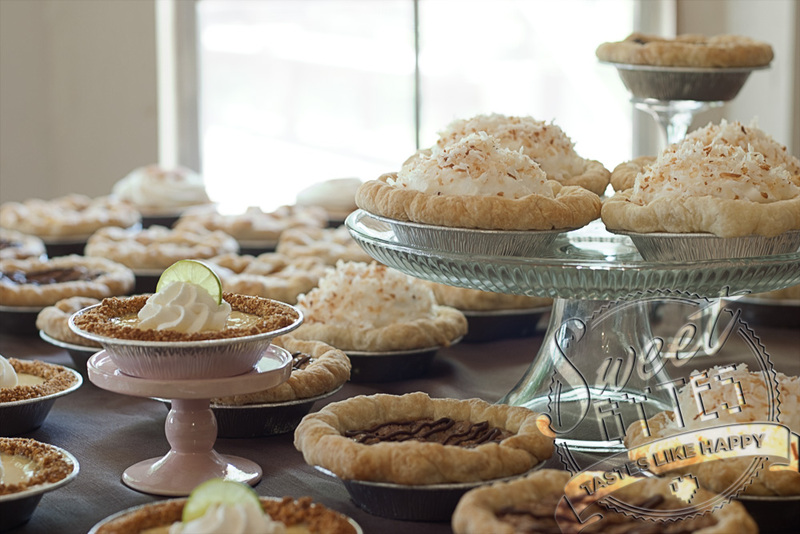 A good Glass Pie Plate will take you far and is fairly inexpensive. It will last your whole lifetime, unless you drop it, of course. I recommend starting your pie baking in these because you can see the bottom of the pie while it’s baking and you won’t ever have to worry if it’s browned enough. The ceramic ones are beautiful and work very well, but you can’t see through them. I’m completely in love with Rose Levy Beranbaum’s Perfect Pie Plate . It is GORGEOUS! If you are sharing a pie or taking it to a potluck, rely on the disposable aluminum pans. I’ve always had good luck with them when I place them on a cookie sheet to bake. These 9 Inch Round Tin Foil Pans have lids to save you the time of having to buy a box for transport. IF you don’t have a scale you will have to rely on measuring cups and spoons, which are the next best thing. I actually use the spoons more than the cups, but I have both. A lot of recipes don’t have the weights listed, so these types of measuring devices are still essential. Here’s a good Measuring Cups And Spoons Combo Set, Silver at an affordable price. I’ve been happier with my steel ones over my other plastic and silicone handled sets. The liquid measuring cups are very nice for heating ingredients in the microwave, holding wet ingredients, and pouring wet ingredients into the bowl. A set of liquid measuring cups like this OXO Angled Measuring Cup Set would do very nicely. I need these for separating out some of my flour (the secret to flaky pie crust) during the recipe, mixing up fillings and all other pie activity. What’s really nice is that they nest inside of each other for storage! I can’t do without this Pyrex Mixing Bowl Set , they are very durable and come with lids. Not to mention they are microwaveable! In addition, I have these Stainless Steel Mixing Bowls , which I absolutely love because there are 6 different sizes and they are extremely sturdy! I don’t bother with any that aren’t heatproof (since the dulce de leche incident of 2014…) Get a few different sizes of these and you’ll be set. I use these High Heat Silicone Spatulas for scraping the bowls, stirring the pot, filling the crusts, transferring ingredients. You name it, these spatulas can handle it! They come in the scraper style or the spoon style and are real multi-function powerhouse in the kitchen. A good knife can save you so much time and effort in the kitchen. For pies, you need good knives for cutting butter into cubes, slicing fruits, chopping nuts, trimming bits of crusts, and so many more things I’ve probably left out. I love this Color Knife Set , I bought mine about 3 years ago and they still have the color and all of the handles are firmly attached. They have endured very heavy use! I do not use the food processor for making pie crust, I love my pastry blender. It’s easy to clean and store and I really like the control I have over the ingredients when I hand cut the fat into the flour. OXO Steel Bladed Dough Blender and Cutter . My hand can fit it comfortably, and it’s sturdier than a lot of others where the handle meets the blade. Moreover, the blades don’t bend when they meet ice cold butter! I’ve bought 3 over the last 5 years and I can tell you that with proper care it will last through at least 1000 pies. 9. Stainless Steel or other non-reactive pans. A lot of pans react with acidic ingredients and give you a terrible metallic taste. Some people say they can’t taste it, but this reaction can also discolor your pans or cause pitting. I love my French Rolling Pin , but I started with a traditional. If you are brand new to baking, stick with a Classic Wood Rolling Pin . You’ll have to try more than one type as you get an opportunity to really help you figure out your favorite. The following are the tools that are very nice to have when you bake a pie, but not essential. I know there are all sorts of pastry boards, mats, clothes, etc. and a good countertop will do just fine. I love this Extra Large Silicone Mat for Pastry Rolling because it has the circles on it for measurements. Also, it cleans easily, even in the dishwasher! I can roll it up or fold it for storage and even though it’s low cost, it has held up to me abusing it. I also like that when I am done rolling crusts it’s so easy to clean up the mess by picking up the mat and dumping it. It does require flouring though, I’ve seen some people proclaim that by using a silicone mat you won’t need much flour, but that hasn’t been my experience. If you don’t have one by now, PLEASE, PLEASE, PLEASE get one. Your baking will become easier. Your measuring time will be cut in half, and your baking skills will improve dramatically because you will be able to have the same amount of ingredients EVERY TIME! I like big bowls and I cannot lie… No? OK. Well, I do like big bowls for making pie crust. It takes a lot of elbow grease and I find that with a larger bowl, I can really get to it. I use a really big one that I can really turn that flour and butter in, like this 13-Quart Mixing Bowl . If I am making huge batches of pie crust, which I am prone to do, this size lets me quadruple my recipe and still have room! I use this Ateco Large Plastic Bowl Scraper to blend my water into my flaky pie crust without touching the crust. You could also use a regular spatula, but this makes me feel like I have more control. I believe in flouring generously, but I dust off the extra flour with a 2 3/4″ large pastry brush before putting the pastry in the pan. I use the smaller, 1″ pastry brushes for egg washes and melted butter. They are precise and their bristles stay put. These are the only brushes I’ve found that don’t loose hair and hold up to use over time: Matfer Bourgeat Flat Pastry Brushes . I have tried all sorts of different types of brushes and I adore these over a silicone brush or any other brand. If you are going to cut any type of lattice crust, I think you will be very happy that you have this Stainless Steel Ruler Set . I say steel because it can take a good wiping, can be used in everything in the kitchen from cake decorating to sketching and it will hold up to use for a lifetime. Parchment paper is great for lining baking sheet to catch pie filling and for lining crusts when pre and par baking. It’s an all-around workhorse in the baker’s kitchen, so don’t worry about buying large packs or rolls, you’ll use it up! You’ll need the plastic wrap to cover your pie crusts while the rest and to cover the top of any cream pie fillings so they don’t form a skin. Plastic wrap also has a million other uses, but I do try to find suitable replacements when I can to cut my use of plastic. I use these over and over and place the wrapped pie crusts in the bags for extra airtightness and protection from fridge smells. Now you are ready to start searching for a pie recipe! Sweet Bytes recipes for pie and everything else can be found under the recipes category, I look forward to sharing them with you. You also can’t beat a good book! I feel like through great pie books, I have learned from the best in the world! Thank you so much for sticking with me through that deep dive into “how to bake a pie!” I hope that you find it useful. If there is anything that I left out or if you have any burning questions, please drop me a line or leave a comment!